As a small portion of our training for an upcoming cycling tour of Nova Scotia, Jack and I headed to the New River Trail today. The NRT is our “hometown” Rails to Trails conversion, and one of Virginia’s state parks. We frequently head down to Galax, the Shot Tower, Fries, or Foster Falls to head north or south along the trail, which we feel is one of the best in Virginia. The section of the Trail we rode today was in good shape, with the notable exception of 4 to 6 miles from right at Austinville through climbing past Billsby Dam (heading south). The rough road was due to horse traffic, whose hooves chop up the cinder trail terribly. Now, I’m not in any way saying that horses should not be allowed on the Trail. As an ex-horse rider myself, I get having a lovely place free from traffic where you can ride. But I really wish the riders were more respectful of other users and kept their mounts closer to the verges where possible. Certainly, there are stretches of this trail where there are no verges at all, between the cliffs on one side and the New River on the other. I get that. And at the road crossings, where we’re all funneled through the anti-vehicle “gates” there’s no choice but to have the hooves hit the trail. But I wish some small consideration for other users more widely pervaded the equestrians. For example: the Trail provides mount/dismount places at each side of the trail where it follows over trestles, so riders can mind the rules and walk their mounts across the trestles. Judging by the extreme chop in the middle of the trail at each end of every trestle along this heavy horse traffic stretch of the trail, not many riders remove to the mount/dismount areas. Instead, they stop their horses, and the horses dance and circle, creating virtual troughs in front of the trestles. These are really rough on bicycle riders, as are all the chopped-up lengths of the trail where discourteous riders insist on riding abreast across the trail instead of using the edges where possible. I wonder if one solution might be for equestrians to pay a surcharge for the maintenance required on the trail due to their “vehicles” leaving behind more damage. Just a thought. And please be clear that I do NOT advocate disallowing horses on Rail Trails. 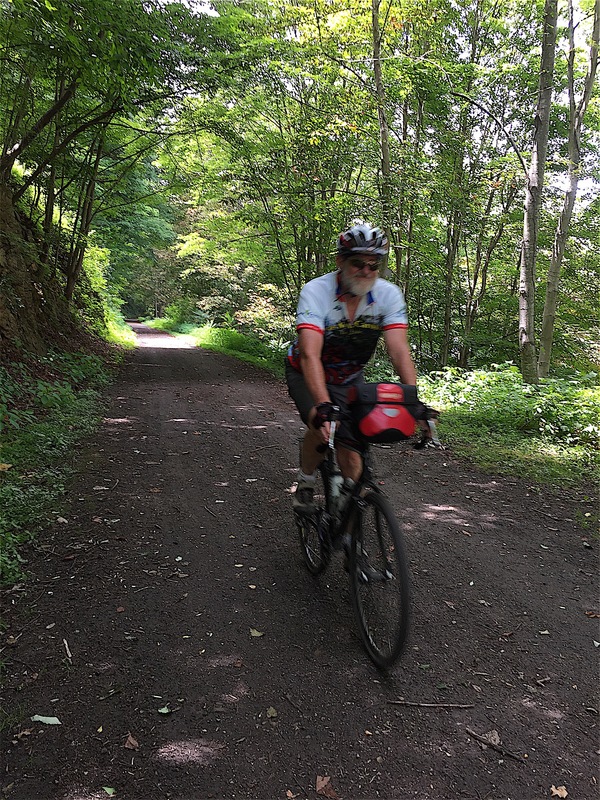 But the stretches for about four miles where we began, at the Shot Tower, until Austinville; and then past Billsby Dam all the way to Fries Junction were blissful. Overall, in a 30-mile ride, to have between 8 and 12 miles (hitting the rough stretches headed both ways) is not terrible — and it was a lovely day along the river. We saw canoeists on the River, and other riders of all ages, and butterflies, birds, and flowers. And this was the highest-mileage day we’ve ridden since we began our 2015 riding in about March/April. Nice that we went 10 miles over our “long” ride-days; however, our “normal” training rides are along the hilly Blue Ridge Parkway. So it was great to extend the time in the saddle without having to climb the several 2-mile mountains we’d have to traverse if we rode the same 30 miles along our normal, nearer route. Next up: soon we’re going to take the Roomba down into southern VA to train along another Rails to Trails Conversion, and I’ll report on that adventure soon. We’re also talking about camping near the New River Trail (the campsites there don’t allow RV campers) long enough to cycle along the full 54 miles of the Trail two days back-to-back. That’s always been a great way for us to catalog lots of time in the saddle, and to test the level of our training right before we leave on a big cycling trip like that we’re heading for this fall.